The Guardian | Trita Parsi: On the two-year anniversary of the historic Iran nuclear deal, Washington is abuzz with renewed calls for confrontation with Tehran. President Donald Trump should roll back Iranian influence through pressure and sanctions, the argument goes. 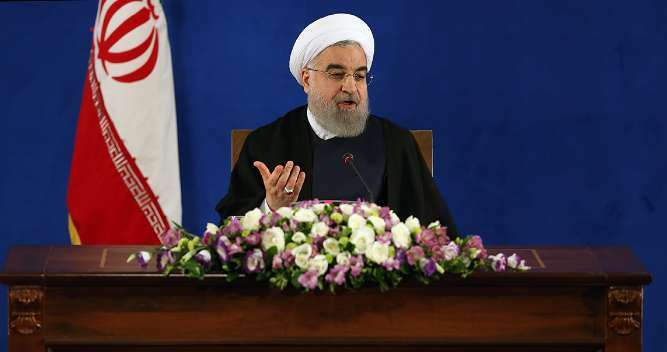 Some even suggest pressure can lead to regime change, failing to see the contradiction in warning about Iran’s rising influence while predicting Tehran’s downfall if only a few more sanctions are imposed. This near-mythological potency of sanctions is rooted in Washington’s narrative on why the nuclear deal came to fruition in the first place: sanctions and pressure brought the Iranians to their knees, forcing them to negotiate their way out of their nuclear rabbit hole. Indeed, sanctions were so effective that had Barack Obama not shifted to diplomacy and eased the pressure on Iran, the clerical regime would likely have fallen by now, critics of the nuclear accord claim. But this narrative is simply false. It wasn’t sanctions that caused the negotiations to succeed and it wasn’t Iran that was close to collapsing right before the talks took off. As I reveal in Losing An Enemy – Obama, Iran and the Triumph of Diplomacy, a very different reality existed behind the scenes.